O holy Mary, my Mistress, into thy blessed trust and special keeping, into the bosom of thy tender mercy, this day, every day of my life and at the hour of my death, I commend my soul and body; to thee I entrust all my hopes and consolations, all my trials and miseries, my life and the end of my life, that through thy most holy intercession and thy merits, all my actions may be ordered and disposed according to thy will and that of thy divine Son. Born in the castle of Castiglione, 9 March, 1568; died 21 June, 1591. At eight he was placed in the court of Francesco de’Medici in Florence, where he remained for two years, going then to Mantua. At Brescia, when he was twelve, he came under the spiritual guidance of St. Charles Borromeo, and from him received First Communion. In 1581 he went with his father to Spain, and he and his brother were made pages of James, the son of Philip II. While there he formed the resolution of becoming a Jesuit, though he first thought of joining the Discalced Carmelites. He returned to Italy in 1584 after the death of the Infanta, and after much difficulty in securing his father’s consent, renounced his heritage in favor of his brother, 2 November, 1585, a proceeding which required the approval of the emperor, as Castiglione was a fief of the empire. 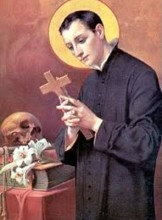 He presented himself to Father Claudius Acquaviva, who was then General of the Society, 25 November, 1585. Before the end of his novitiate, he passed a brilliant public act in philosophy, having made his philosophical and also his mathematical studies before his entrance. He had in fact distinguished himself, when in Spain, by a public examination not only in philosophy, but also in theology, at the University of Alcalá. He made his vows 25 November, 1587. Immediately after, he began his theological studies. Among his professors were Fathers Vasquez and Azor. In 1591, when in his fourth year of theology a famine and pestilence broke out in Italy. Though in delicate health, he devoted himself to the care of the sick, but on March 3 he fell ill and died 21 June, 1591. He was beatified by Gregory XV in 1621 and canonized by Benedict XIII in 1726. His remains are in the church of St. Ignazio in Rome in a magnificent urn of lapis lazuli wreathed with festoons of silver. The altar has for its centerpiece a large marble relief of the Saint by Le Gros.